This is the first in a series of many web pages to follow. Safety and Health issues have always been a number one priority at the Old Hickory site. From gate searches for matches, to concerns for adequate drinking water, to the massive outbreak of influenza, the powder plant employees as well as the first rayon employees were pioneers in the safety heritage of Old Hickory. Portion of Old Hickory powder plant is shown in 1918 photograph. From right, areas prepared cellulose used in manufacture of powder, nitrated it and then stored and purified the material. Note safety chutes at windows of nitration buildings (front). They were used for use by plant operators when temperatures in the batch process rose to dangerous levels, threatening an explosion. - Our Old Hickory Heritage, 1982 Note the American flag flying on the left. There is mention of the purchase of an American flag by employees to fly over an office building in the August 18, Powder Plant News edition. As an employer, the Du Pont Company was concerned about the health and safety of its workers. Smokeless powder was a much less dangerous substance than the black powder Du Pont had manufactured in earlier times, since it was explosive only when it was burned in a confined medium. But Du Pont took precautions both in the design of its plants and in the training of its workers to reduce the likelihood of explosions and resultant injuries. The plant at Old Hickory was constructed with light weight building material, such as wood and sheet metal, to reduce the danger of falling debris in case of explosion. The various units at the plant were dispersed to prevent any fire from spreading from one to another. Guards were erected on all moving machinery, and shower baths were installed at all locations where dangerous acids were present. Buildings were equipped, where powder was processed, with escape windows and metal chutes to allow workers to evacuate quickly in case of any danger. Du Pont established policies both to prevent accidents and to prepare workers to react properly in case of accidents. Each new employee was given a booklet which described the plant and its mission and stressed the importance of safety and of reporting and seeking treatment for all injuries. All workers were required to attend safety lectures regularly. Posters everywhere warned workers of dangerous areas and emphasized the importance of safety measures. Movies provided for the entertainment of the workers and their families were always preceded by a safety message, and fire drills were held periodically. Fire constituted the greatest danger and no matches were permitted in the plant gates. Workers were searched before entering the production area and were fined or fired if they had any matches in their possession. As a result of the safety precautions instituted at Old Hickory, accidents were kept to a minimum. Accidents causing personal injury or death were more often caused by railroad and automobile mishaps than by functions of the powder units themselves. By August 1, 1918, of ten men who had been killed at Old Hickory, five had been killed by moving railroad trains. At least two of them allegedly had been run over while hiding or sleeping under railroad cars. There were several fires and explosions at the plant. The first powder fire occurred on November 6, 1918, when 85,000 pounds of powder burned in a blending tower, injuring three men, two of them seriously, but killing none. On December 26, 1918, a spark exploded 300,000 pounds of powder in a blending tower, but caused no injuries. The blending process was the most dangerous functions performed in the plant, and men were forbidden to enter the surrounding area while the machinery was in motion. Note: Brand's sources include the Old Hickory News (August 18, 1918) and Tennessean and American (June 26, 1918). Rayon Yarns attributes the source of the spark mentioned in Brand's thesis as coming from lightening. There is a photo of this explosion, but the quality is too poor to scan. Unless you are willing to be careful to avoid injury to yourself and fellow worker do not ask for employment here. We do not want careless employees. This sign tells the story of the constant fight waged against carelessness and consequent injury by the Old Hickory plants with consequent success and recognition. In brief we might remind our readers that the safety movement as we know it today had its origin in Milwaukee back in 1912. The following year the National Safety Council was organized with a handful of members. It is significant to note that last year the National Safety Council celebrated its Silver Anniversary with a grand total of 5,000 members and 400 foreign members. 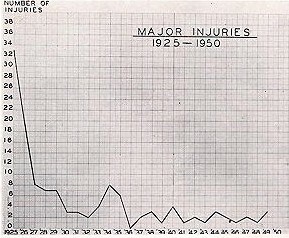 Figured on the basis of statistics it was estimated that the Safety movement had been responsible for saving 285,000 lives during the 25 years. The du Pont Company, recognizing the need for safety in industry, was one of the first large concerns to see advantage of instituting safety first measures. A safety department was created in Old Hickory in 1925 with J.T. Brown, present supervisor in charge. The record established by the local plants has been outstanding. Today, the Old Hickory Rayon plant holds the National Safety Record established March 22, 1937 with 11,361,846 man hours without a major injury. Prior to that time, the local Rayon plant had held third place with 9,166,934 man hours. This record being established October 5, 1932. The Westclox Division of the General Time Instrument Corp. holds second place with 11,114,000 man hours. J.T. "Jack" Brown, safety supervisor for the du Pont plants in Old Hickory, has the very vital job of seeing to it that every employee remembers to be careful all the time. It has been under his supervision that outstanding records and progress in safety work were made by the local plant during the past ten or fifteen years. Mr. Brown was employed at several other places with the company before he came here in 1925, among them Gibbstown and Pennsgrove. During the war he served in the U.S. Marine Corps. 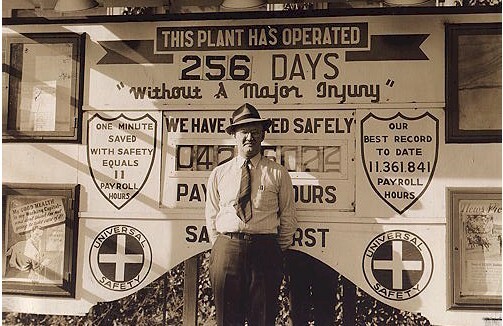 "This record," according to Mr. Brown, "has been accomplished by concerted accident prevention programs such as the June No-Accident drives, poster contests and the safety congress and participation in the company award program in which prizes are given employees of plants going specified lengths of time without injuries." It is well to mention in this connection that the Rayon plant has won eight awards and the Cellophane three. At the time of this writing both plants have a splendid chance to win other awards. The Cellophane plant has just completed the period required for winning a handsome plaque which will be presented their representatives at the National Safety Congress which will be held in October. The first Old Hickory Safety Congress held March 24,25 and 26 at the gymnasium building proved an unusual success. Twenty-five unique displays attracted thousands of spectators. Since the beginning of operations in Old Hickory the Rayon and Cellophane plants have been successful in negotiating three accident-free years. 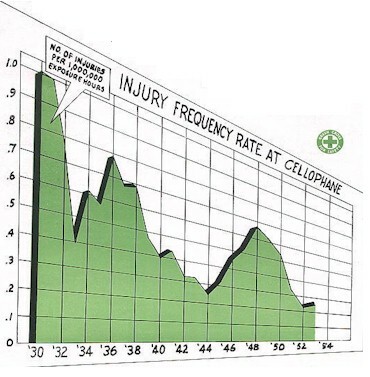 Cellophane had no injuries in 1935 and 1937, while the Rayon plants went through the calendar year of 1936 with complete safety. Asked why the du Pont company stressed safety to such a degree, Mr. Brown replied, "because Safety pays both employee and employer. Top: Safety record for Cellophane. Bottom: Safety Record for Rayon.